A fifth of Britons wrongly believe they cannot get sunburnt if they already have a tan, while half do not realise they can get sunburnt through a window. That's according to figures from a YouGov survey of 2,250 people commissioned by Macmillan Cancer Support. The findings highlight a lack of knowledge and reveal lax attitudes towards tanning and sunburn as many individuals continue to put themselves at risk of skin cancer by not taking the necessary precautions on holiday. People with pre-existing medical conditions such as skin cancer can ensure they are protected on their adventures abroad by making a point of purchasing adequate travel insurance before jetting off. Some 22% of Brits do not believe they can get sunburnt if they already have a tan, while 2% believe exposure to a full moon at night time can lead to sunburn. The poll also reveals that 15% are more worried about things like the risk of uneven tan lines, peeling, age spots or wrinkles. Furthermore, nearly one in five is more worried about the pain that sunburn causes than being told they have cancer as a result. Macmillan Cancer Support describes it as "worrying" that so many individuals seem more concerned with their appearance than the risk of cancer. The shoulders, back of the neck, back, legs, nose, chest, forehead, feet, hairline and scalp and ears are the most common places to get sunburnt - so using sun cream is highly advised by health officials. But it appears a significant number of people are not paying attention to this guidance. 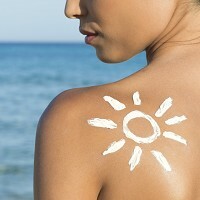 Up to 33% of Brits use suntan lotion that is out of date, while as many as 19% use tanning oil rather than sun tan lotion. Carol Goodman, a skin cancer nurse specialist on the Macmillan Support Line, says skin cancer death rates in the UK are among some of the worst in the world. She claims this is largely down to the fact that people are still very ignorant about the risks of the sun.